Ulysses girls basketball has earned the Western Kansas Team of the Week from American Implement. 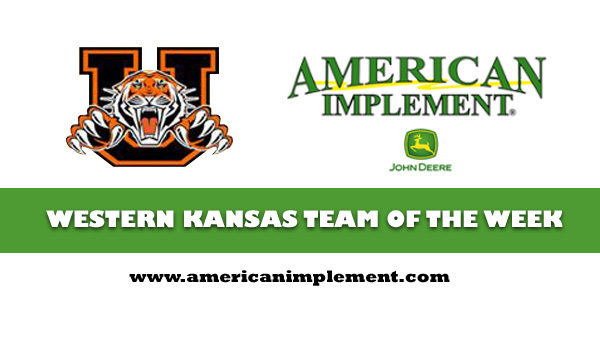 Ulysses girls basketball has earned the American Implement Western Kansas Team of the Week from Sports in Kansas. Last season, Ulysses girls went 14-8 and were ranked seventh in the final Class 4A, Division I poll but had McPherson, the eventual state titlist, in its sub-state. This year, Ulysses returned six seniors and opened the year ninth in 4A. Senior Gina Ballesteros averaged 12.8 points and 5.1 rebounds, while Alyssa Castilleja delivered five points, 3.2 rebounds, 3.1 assists and two steals. Madison Haney averaged 6.3 points, 5.1 rebounds and 2.1 steals. Riley Oglevie delivered six points and 8.8 rebounds a contest. This year, the veteran-laden Tigers opened with a 50-20 victory against Cimarron, which is expected to challenge for the Hi-Plains League title again. Ulysses had two big quarters and outscored the Bluejays, 11-2, in the first quarter and 22-4 in the third quarter. Last season, Ulysses defeated Cimarron, 49-26. Before then, the Tigers had lost seven in a row to Cimarron. Coach Tim Hofferber has done a nice job of turning around the program. From ’10-11 through ’15-16, the Tigers did not have a winning season. Ulysses is 4-17, 11-10 and 15-8 the last three years. This week, Ulysses is at the Hugoton Blue and Red Classic tournament and could get a matchup with the host Eagles, ranked seventh in 3A.